“ISO Workshop” is a free and a powerful disc image manager that lets you create, burn, convert and extract their content under the MS Windows platform. It has an extremely newbie friendly interface and a lot of features (relatively speaking) which is all good. But one thing that bugs me is its inability to let you resize its window. The default size of its window is a bit too big (I think), but unfortunately, we cannot resize it. So hopefully, they’ll fix it in the future releases. It lets you create images from discs, however, we cannot create a disc image from scratch by adding files/folders though (well, to be fare, it’s not something that most users will be needing anyway). Otherwise, it’s pretty much like the “all in one disc image manager” that you’ve always been looking for ;-). *. Converts disc images into ISO and BIN from various other format such as: NRG, MDF, CDI, IMG, GI, PDI, DMG, B5I & B6I. *. Creates images from discs (into ISO or BIN/CUE). *. 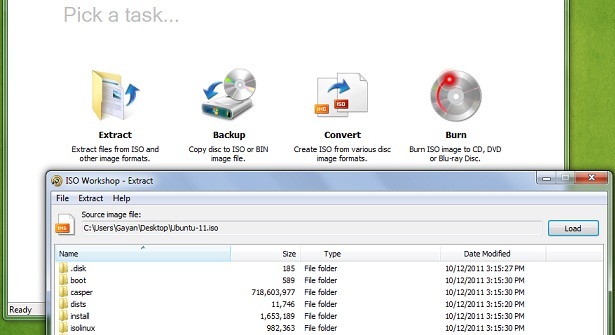 Burn disc images into CD/DVD and Blu-Ray media. Though most archive managers support reading & extracting certain types of disc image contents (especially the ISO format for instance), but if you want to extract the content of other formats such as NRG or MDF etc, without having to convert them into ISO first, then this feature will come in handy. If you wanna give it a try, then please get it from this “ISO Workshop” product page. Enjoy!.